If you are a property owner or manager of a commercial building, chances are you’ve dealt with a leak or other roof damage at some time or another (likely many times). E&E Construction’s premium roof coatings are one of the best ways to protect your industrial building against water penetration or other damages that commonly threaten your roof. 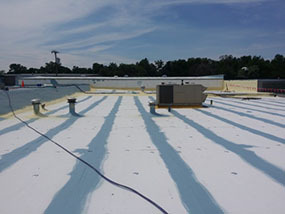 Roof coatings offer superior defense against many of the issues that commonly afflict commercial roofs and also save building owners the significant expense of a roof replacement, often extending a roof’s life by many years or longer. Additional savings are also found in the form of energy efficiency and reduced labor costs. Call E&E Construction at (740) 331-0695 today to learn more about our high-quality rood coatings and see if they are an option for you! Roof coatings go by many other names: seamless roof systems, liquid-applied or fluid-applied roofing systems, seamless roofing, monolithic membranes. Regardless of the terminology, they are a great choice to protect your building, and are applied directly to your existing roof surface. SPF is the most impact resistant of these coatings. It is durable, resisting dirt and water better than the other options. However, it is more expensive than an acrylic coating and can emit a stronger smell than some other options. Silicone roof coatings are attractive for their ability to cure, even in high humidity – in fact, moisture encourages curing in this coating. They don’t get brittle over time. However, silicone tends to hold onto dirt, and when your roof needs re-coating (usually after about 10 years), the prior coating must be removed or re-coated with a compatible silicone. Acrylic coatings are the most cost-effective option, and easy to work with. However, they thin over time as they weather and are the least resistant to standing water. Reflective – Cool roof coating systems are usually white or light colored, designed to reflect the sun’s rays and, therefore, its heat. Coatings have been shown to reflect up to 85% of UV radiation. Energy Savings – By reducing the amount of heat that your roof absorbs, roof coatings can drop energy and A/C bills by as much as 30-50%. Reduced Maintenance – Roof coatings can significantly reduce the frequency and cost of needed roof repairs, as well as slow the overall deterioration of your roof. “Green” – Compared to a roof replacement, roof coatings are environmentally friendly, keeping tons of material out of landfills. 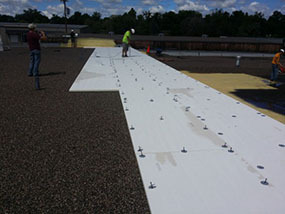 If you would like more information on roof coatings, call (740) 331-0695 today. The professionals at E&E Construction can walk you through all your options, give you a free estimate, and schedule a time to inspect your roof to see if it’s a good candidate.